General Motors has delayed the introduction of its Super Cruise technology a handful of times, but it’s finally nearing a completion. During one of Cadillac’s latest ad spots, the “Pioneers” ad that debuted during the 89th Oscars, fine print spelled out when we’ll see the autonomous driving technology. 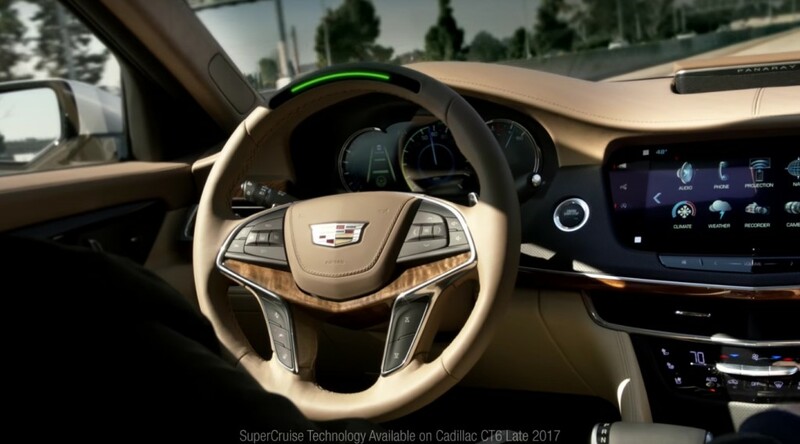 Super Cruise will arrive with the Cadillac CT6 in “late 2017“, according to the brand’s ad and a brief video of the technology in action has been posted to Cadillac’s official Facebook page. Not much is known about how the technology will actually be activated, but we can see a light strip embedded into the steering wheel, which will likely change colors based on the system’s readiness to activate. The video also shows the driver pressing a different steering wheel-mounted button to activate the system. After that, it’s a hands-free driving experience. Super Cruise is slated to only work with highway driving and is reportedly not to be used on local roads. The system will also track the driver’s eye movement to ensure there isn’t a disconnect even when the car is driving itself. In fact, the car can even pull itself over if a series of alerts aren’t acknowledged by the driver should he or she, for example, fall asleep. Cadillac President, Johan de Nysschen, has already told us the brand will always offer the choice to drive the vehicle and will steer clear of “transportation pods.” So, don’t worry about a 640 hp fully-autonomous CTS-V in the future. Next story Community Question: What Do You Want To See From The 2018 Buick Enclave? This is so kool, I love this new technology! I can’t imagine anybody who wouldn’t want or like this technology! Agreed! I own a 2016 CT6. Will trade on a 2018 with SuperCruise.. I like to be a “first adopter” (and have been in many arenas); BUT, this is one technology I will sit back and wait on. Aside from the enormous complexity of the software and hardware, even if they DO everything “correctly” the car might still be programmed to kill you rather than 2 drunks wandering into your pathway. Sorry.. this is one I will sit out.